For the 2019 Spring season the NVYLL boys’ divisions will follow the US Lacrosse age segmentation guidelines as shown below. 14U will be mostly 7th and 8th graders. Kindergarten players wil be accepted based on a case by case basis. For those 8th graders who fall outside of the age breakdown for 14u those players will still be allowed to play on an NVYLL club team. Boys' games are usually held on Saturdays; Girls' games are usually held on Sundays. For more information email or to register go to www.brlax.com and click on the Register Online tab. 2018 LACROSSE SEASON is complete!! 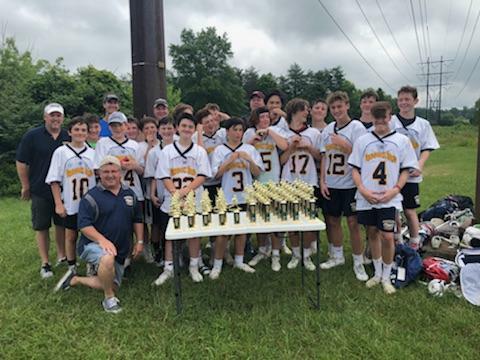 CONGRATULATIONS to the boys at Braddock Road Lacrosse who participated in the end of season Championship games. We had 5 teams playing in the playoffs and 4 of those teams brought home the NVYLL Championship Trophy.